C-reactive protein (CRP) is a protein produced by the liver and found in the blood. The level of CRP rises when the body suffers inflammation. Inflammation, in itself, is not a serious problem. Typically, it occurs in response to trauma, illness or infection. 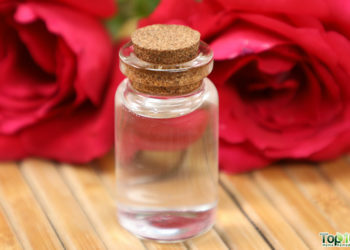 In such cases, inflammation may manifest in various forms, such as hives, rashes, a sprained ankle or a sore throat. However, inflammation that persists is a great cause for concern and can be indicative of serious disorders. A CRP test is a simple blood test that could measure your body’s inflammation level based on the level of CRP in your blood. This information could be crucial to identifying a hidden health risk that standard, and even specialized, checkups often miss. Several studies have found that abnormal CRP levels can be an early warning sign of trouble. While an abnormal CRP level alone is not indicative of heart disease risk, when combined with increased low-density lipoprotein (LDL or ‘bad’ cholesterol), blood pressure, blood sugar and triglycerides, it definitely calls for immediate medical attention. In fact, an abnormal CRP level may identify a person at high risk of a first heart-associated event (disease, attack or stroke) that may not present itself during a regular lipid checkup, according to a 2005 study published in The Journal of the American Osteopathic Association. A 2002 study published in Diabetes Care found that increased body mass index (BMI), uric acid and blood glucose were positively associated with increased CRP levels and body inflammation. All the above mentioned conditions are increasingly high-risk factors for heart disease, attacks and strokes. It is common knowledge, nowadays, that heart disease is directly linked to increased trans-fat intake through foods like processed bakery goods, shortening-based desserts and margarine, among others. CRP levels were significantly higher in subjects who consumed a high trans-fat diet as compared to those who did not, according to a 2005 study published in the Journal of Nutrition. CRP levels are also a moderate indicator of coronary heart disease (CHD), according to a 2004 study published in The New England Journal of Medicine. CHD is a disorder in which the arteries are blocked, obstructing the flow of oxygen-rich blood to the heart and brain, usually resulting in a heart attack or stroke. According to the American Association for Clinical Chemistry, low but persistent levels of CRP are an indication of arterial blockage that may develop into CHD. A CRP blood test will be able to identify such a cardiovascular development. The best way to determine a future cardiovascular risk is to get a CRP blood test done – preferably a high-sensitivity C-reactive protein (hs-CRP) test – along with a lipid profile test. A high CRP level and increased inflammation are also associated with Type 2 diabetes – another risk factor for heart disease. Out of 188 subjects who would go on to develop Type 2 diabetes in a follow-up period of four years, 15.7 percent reported high levels of CRP, according to a 2001 study published in The Journal of the American Medical Association. Persistent, long-term inflammation of body organs may drive them toward cancer, according to a 2006 study published in Molecular Cancer Research. While an elevated CRP level is by no means concrete proof of cancer, it is a crucial indicator that could direct a high-risk individual toward diagnosis. For example, a 2004 study published in The Journal of American Medical Association found that CRP levels were at their highest in subjects who went on to develop colon cancer in the future. A CRP blood test could be useful in successfully predicting the early progression of rheumatoid arthritis (RA), an inflammatory autoimmune disease. The CRP blood test was identified as one of the key tests involved in evaluating the progression of RA in patients in order to successfully determine who will require the strongest medication therapy in the future, according to a 2000 study published in Rheumatology Oxford. Obstructive sleep apnea (OSA) is a sleep disorder caused by an obstruction in the upper respiratory tract that prevents normal breathing. It is typically (but not always) caused by obesity, is indicative of body inflammation and is a high-risk factor for heart disease. An increased CRP level can be an indicator of OSA. Blood CRP levels were found to be significantly higher in study subjects who had recently developed OSA than in those who had not, according to a 2002 study published in Circulation. Therefore, if you have trouble staying asleep, a CRP blood test could help identify an underlying sleep apnea condition and potential heart-disease risk. Crohn’s disease is an inflammatory bowel disease. If you have been suffering from gastrointestinal discomfort for some time and think it might be more serious than a case of indigestion, a CRP blood test may help identify a specific disease for which you can seek focused medical care. A high CRP level was positively associated with Crohn’s disease, according to a 2013 study published in The American Journal of Medical Sciences. 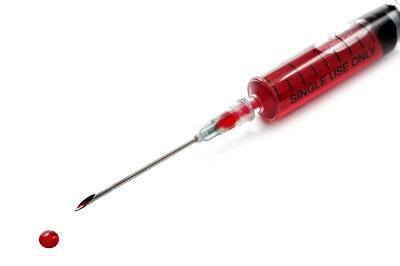 As illustrated above, a CRP blood test might just save your life. According to the American Heart Association, a CRP test is most beneficial to those who might be at a high risk of having a heart attack within the next decade. If you are generally unhealthy, have a family history of heart disease and do not exercise much, a CRP test now might be a wake up call to prevent a future heart attack. Furthermore, an abnormal CRP level, along with other symptoms, might give your doctor more information with which to consider a disorder that he or she had not previously contemplated. He or she may then suggest focused tests that might just identify your disease. So, the possibilities and benefits of a CRP blood test are countless, and prevention is always better than the cure. You can request a CRP blood test at your local clinic or any other medical facility you trust. 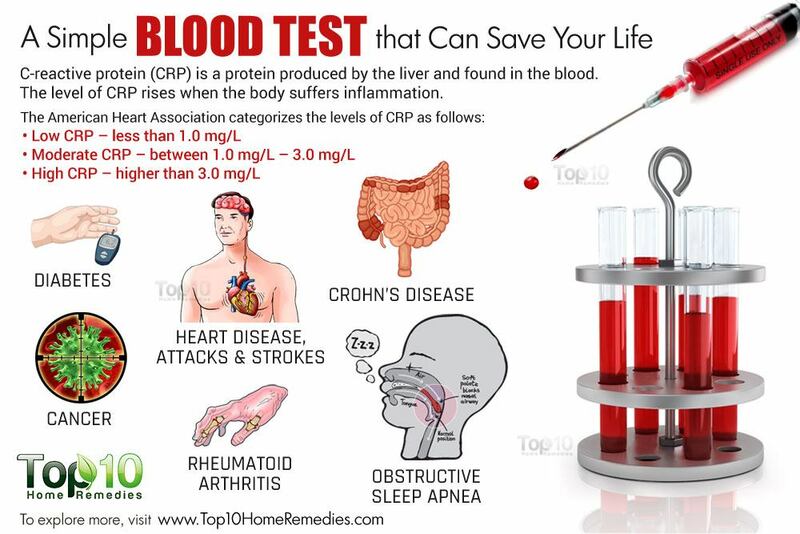 A CRP blood test is performed like a regular blood test and takes just a few minutes. An elastic band is tied to your upper arm to trigger blood flow into your veins. The selected puncture area is then wiped with an antiseptic before a needle is inserted and the blood is collected into a syringe or a vial. After the needle is removed, a pressure wrap is applied to the puncture point. This is a generally risk-free procedure. You may experience slight tenderness and soreness around the puncture area. In rare cases, and when proper hygiene is not practiced while performing the test, the area may become infected. Very informative. I love reading this page during my free time. Thank you for sharing this would be a big help for my future plans to pursue my Caregiver job. God Bless You and more power!